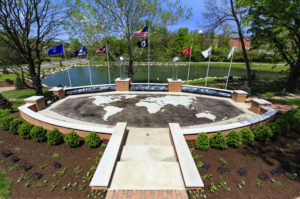 The American Pride Veteran Memorial is located on the north side of the Ohio’s Hospice of Dayton’s building at 324 Wilmington Avenue in Dayton. The memorial has multiple illustrated panels dedicated to individual military involvements – the Revolutionary War, Civil War, World War I, World War II, Korean, Vietnam, Desert Storm and the War Against Terror. Each branch of the service is also represented with a panel of its own. The floor of the memorial is a map of the world, reflecting the international scope of conflict. Each branch of the United States service is represented with a flag, along with the state flag as part of the memorial. The American flag will fly proudly in the center. The memorial was designed and constructed by Paul J. Striebel and Associates architects of Centerville. Veterans and families we have the honor and privilege of serving. By recognizing the unique needs of our nation’s Veterans who are facing a life-limiting illness, Ohio’s Hospice of Dayton is able to accompany and guide Veterans and their families toward a more peaceful life closure. We help assure access to all the benefits to which a Veteran is eligible, provide spiritual support and address individual post-traumatic stress issues. Click here to to enter information about your loved one and upload photos. All stories submitted will be accessible online and on display at the American Pride Veteran Memorial. The stories are searchable by name. Any Veteran from the Greater Dayton region is eligible to be included.